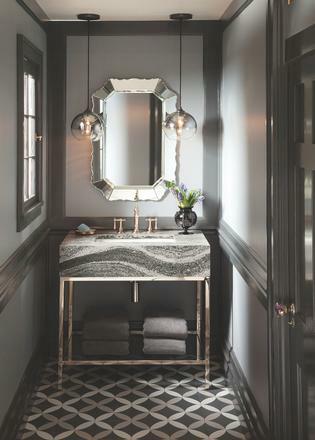 Cambria’s journey began 17 years ago when the enterprising Davis family purchased some equipment from a small start-up company and began manufacturing engineered quartz stone surfaces for use in bathrooms and kitchens. Their enthusiasm and passion for the product was immediately apparent and, in 2001, Cambria opened its first processing factory in the small town of Le Sueur, in southern Minnesota. Since then Cambria has grown exponentially, launching myriad new products and collections, opening showrooms and distribution centres across the United States and Canada, and moving into international waters with suppliers in the UK and Europe. Cambria’s natural stone surfaces can now be found in some of the world’s leading hotels, national sporting arenas, business centres, hospitals, restaurants, and schools, as well as in residential homes and superyachts across the globe. Cambria offers a vast product range of natural stone surfaces, from traditional designs to contemporary styles, as well as stone created to complement particular woodwork, furniture and other interior accessories. Designs include but are by no means limited to Westminster, a bold stone surface in rich tones of reddish-brown and black; Rose Bay, with a white base and black veining that is strikingly abstract in its effect: and Brittanicca Gold, with its streams of gold, copper and grey-beige flowing through a warm off-white backdrop. From the beginning, Cambria has insisted on using only the highest quality materials to produce the very finest natural quartz with unparalleled depth and clarity. 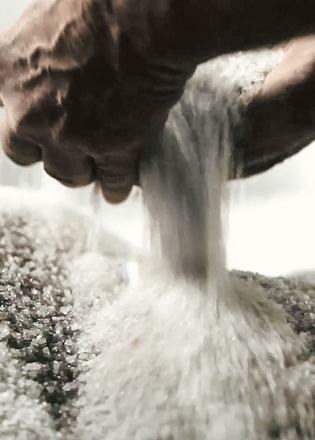 Each and every stone surface is handcrafted at the original family-owned plant, using state-of-the-art, self-developed technology and locally sourced craftsmanship. As well as being exceptionally beautiful, Cambria quartz stone is particularly robust, making it especially suited to superyachts. Unlike other natural stone surfaces like granite and marble, which require regular sealing and polishing, Cambria is less likely to scratch, chip or stain. It is also completely non-porous, so spills and moisture are never absorbed; the surfaces can simply be kept clean with warm water and soap. Cambria is a company with a conscience. 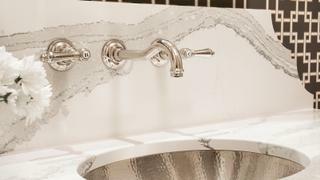 As well as ensuring that all of its quartz is responsibly sourced by conscientious partners, the factory recycles and reuses where possible, including 100 per cent of the water used to polish its surfaces, saving an estimated 1.6 billion gallons of water per year. As well as being better for the environment, the stone surfaces are also better for the customer: because the stone is 100 per cent non-absorbent, it cannot harbour any harmful bacteria. It also has Greenguard Indoor Air Quality Certification, an assurance that the product meets strict chemical emissions limits contributing to a healthy interior environment even in a small space like a bathroom. When choosing the perfect stone for your bathroom, spa or kitchen project, you can also rest assured that any purchase will be backed up with the highest level of customer service. As all of Cambria’s products are made at its own facility, its talented team of craftspeople can check and recheck the quality at every step of the manufacturing process, ensuring the perfect end result. So confident is Cambria in the quality of its products that it offers a lifetime guarantee on every stone surface it makes. For beautiful natural stone surfaces that offer quality, easy care and uncompromised durability for even the hardest working superyacht, make Cambria your first stop.